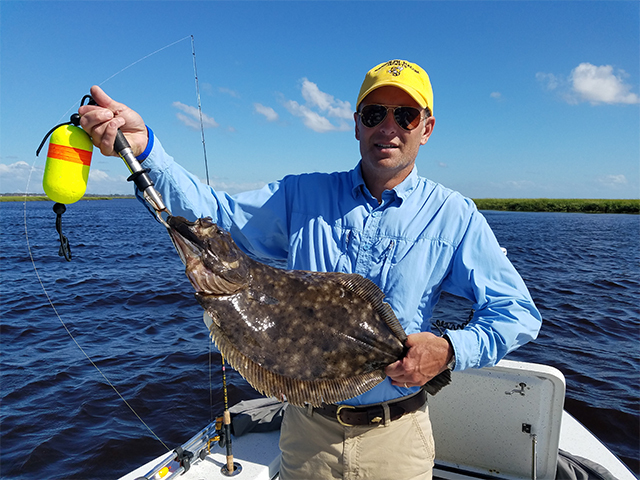 Backwater Fishing Amelia Island is always an adventurous experience especially with Redfish and Flounder fishing in particular. I went out with Michael today to do some backwater fishing in the creeks and rivers around Amelia Island. The weather was not the best. We had winds coming out of the northeast at 18 to 22 mph. We talked it over at the dock and decided to give it a go. Michael was an experienced fisherman and had fished all over the country. We arrived at our first fishing spot. With a live mud minnow under a floating cork, Michael made the cast. The tide was about an hour before dead high. The cork drifted over some oyster mounds that were covered by the high water. Between the wind and the tide, casting and getting a good drift was tough. About the fourth drift the cork went down and Michael set the hook and reeled in a small speckled trout. A few more casts and a couple smaller trout. We did eventually pull in a couple keepers which were released. I decided to move to another spot. We arrived at our second area to try and fish. Michael did a great job casting despite the strong winds. We had no takers on this spot this morning so again we headed further back in the river to maybe find a place out of the wind. By this time the tide was flowing out pretty good. I found an area that had some deeper water and good structure on the bottom. On the first cast as the cork was drifting a fish grabbed the mud minnow and pulled the cork down. A beautiful 18-inch trout was netted, after a couple pictures released back into the water. I worked the trolling motor so the boat would stay in position so that Michael could cast. He made several more casts and drifts which yielded a few nicer trout. I suggested to Michael to cast to a corner where the water was flowing past some structure. He made a perfect cast and It was not 20 seconds when a big fish slammed the bait. We both hollered redfish on, as the fish started taking drag. The tide and wind made it hard to keep the boat in position. The fish was really fighting hard to get off. After what seemed an eternity the fish surfaced and Michael yelled big flounder. The fish dove back down and headed for the back of the boat. Michael was doing his best to try and work the fish back towards the front of the boat. I tried to net the fish but the way the tide was moving and the wind pushing the boat we missed the net and the fish took off again. Again, we worked together and was able to get the big flounder in the net the second try. We gave each other a high five, the fish measured 26 inches and weighed 7.1 pounds. We fished a little longer trying to catch a redfish. 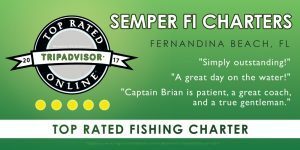 The Florida DNR has a program and issues citations for an inshore slam, which consists of a Speckled Trout, Flounder, and Redfish caught on the same trip. We gave it our best shot but could not find a redfish and headed back to the Fernandina Beach Marina. The flounder yielded some very nice fillets for the dinner table. Michael stated that was the biggest flounder he had ever seen or caught backwater fishing Amelia Island.